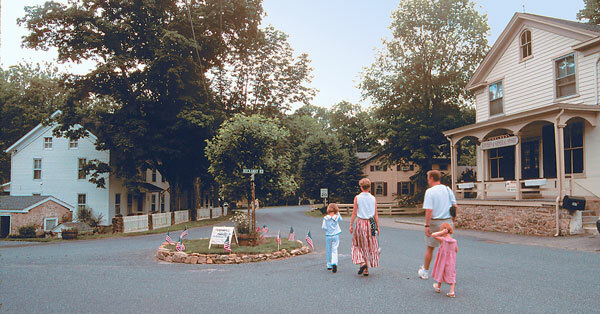 Hunterdon County contains over 40 historic districts on the National Register. 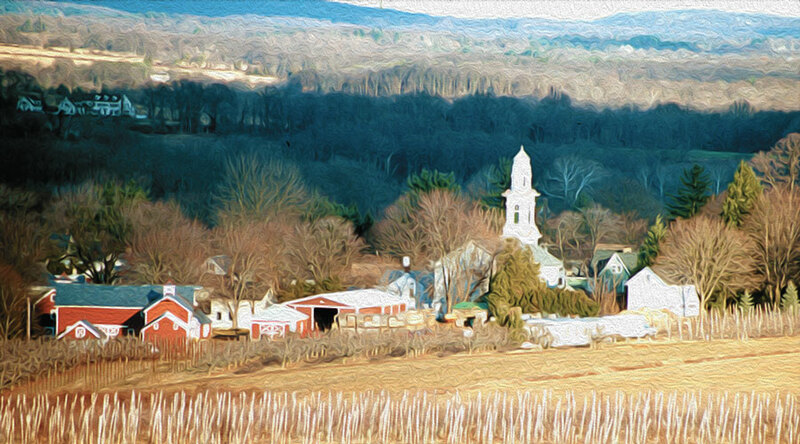 Some of those, in Tewksbury Township, are located in some of the most beautiful and serene countryside in New Jersey. With a little historic perspective, your trip through these antique villages will become an excursion of discovery. An afternoon driving or biking along this route is time well-spent; one that you'll likely tell your friends about. From Interstate 78, County Route 523 strikes north to meet Route 517 just as it greets the village of Oldwick. The earliest European settlers here were English. As early as 1734 these citizens named their village "Smithfield" after its most prominent resident, Ralph Smith, who built the first mill in Tewksbury Township on Cold Brook. Most of these early occupants were farmers, with a few tradesmen to serve them who were located in the village. From these early days there was a general store in Smithfield. Around 1745, German immigrants began to settle in this area and soon made up the majority of the village's population. 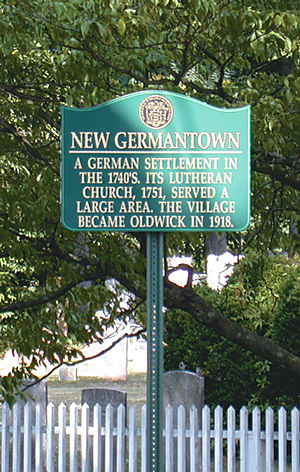 By 1754, Smithfield had become "New Germantown" and would retain that name until 1918, when Germany became America's enemy in the First World War. In 1765, at age twenty-two, Dr. Oliver Barnet came to New Germantown, began his medical career, and bought Smith's Mill, using it to give poor patients a way to pay off their medical bills. Another of his investment properties was a tavern located on Hill Street, built in 1800, now in service as the Tewksbury Inn. The doctor built what is today the Oldwick Community Center as a schoolhouse for community use, then named Barnet Hall Academy. The first commercial structure in New Germantown was a general store located on Church Street, followed by the introduction of a hotel, and by a tavern built by John Farley on land that he purchased from the Zion Lutheran Church. This church was a magnificent stone structure built by these German-American Lutherans in 1767; it remains prominent in the village. By the 1870s, business in the town had begun to decline and became less diversified. 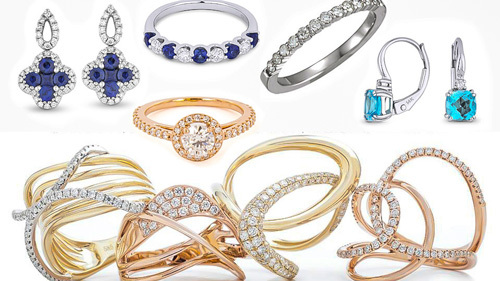 The only operation to show any growth in this period was the carriage manufactory. Some of the decline was blamed on the lack of new rail transportation in the area, which would open up a wider market for the area's large peach crop. The Rockaway Valley Railroad went into operation between New Germantown and Whitehouse and brought back a little prosperity for farmers, until 1913, when blight devastated the local orchards. The railroad never prospered and went out of business. Later, prosperous families from the big cities began to buy the farms and beautiful land in the area. The fine older homes were not torn down but, instead, were restored to their past beauty. And new homes were located on large acreage on forested hillside. Oldwick, with its new name, was starting a new life. This situation prevails today, and the village center is busy. 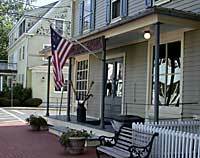 Route 517 is Main Street, but most of the old homes and stores still stand proudly, dating back a century and a half. Follow Route 517 out of Oldwick and turn left on Hill and Dale Road. Turn right when it "Ts" at Rockaway Road and follow that into the village of Mountainville, northwest of Oldwick. The principal significance of this location was the fact that this village, originally called "Bulls Head", was nestled in a narrow valley at the confluence of four mountain streams. As early as 1803, Joseph Sergant acquired 15 acres of river-front property and established there a saw mill. But for many years this was the only non-agricultural business in the area. The "boom" period for Mountainville began prior to the mid-1800s. 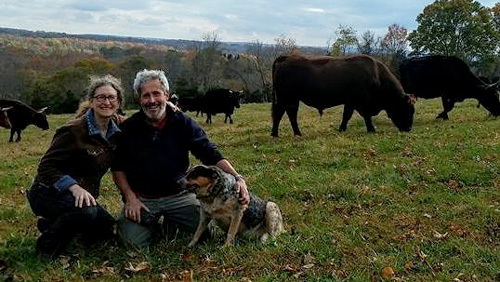 During this period, Daniel Potter, a competent member of the family that had created the village of Pottersville at the eastern edge of Tewksbury Township, moved his Bull's Head Tavern from his farm and attached it to a home in the village. And, in 1832, the Mountainville Academy was constructed and served the community for many years as its local educational institution. Around 1850 the first general store was established in town by Wesley Lindaberry, and in 1859 a post office was established here with Hiram Lindaberry as postmaster. Jonathan Hoffman established a distillery in town at about the same time and somewhat later built several houses here as a sideline business. In 1869, Joseph Farley built and operated a second general store and shortly thereafter, Jacob Apgar built and operated the area's first carriage factory. By 1860 the old school was replaced by a new and larger one, and in 1870 John Apgar opened a wheelwright shop. Three years later that old saw mill was replaced by another grist mill. At about the same time, outdoorsmen visited Hell Mountain, which overlooked Mountainville, and had many successful hunting expeditions for the vicious wildcats living there. 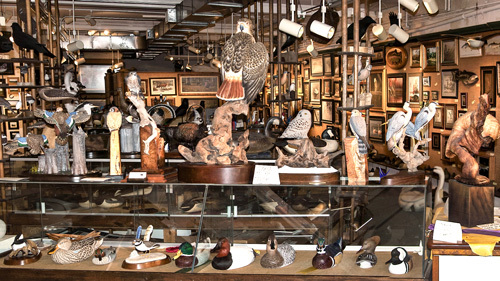 This was a hunter's paradise into the 1870s. As railroads and turnpikes elsewhere took commercial activity away, the village became a small summer resort area. Several urban visitors lived with local families or stayed at the Mountainville Hotel or at Lindaberry's boarding house during the summer months. The hotel stayed in business until the 1930s, and Farley's general store lasted until 1964. It has since been occupied by a series of restaurants and eateries. Downtown Moutainville, Farley's Store on right. Here too, rather than insist on modern structures, families have purchased some of the old ones and possibly provided them with a little discrete updating. 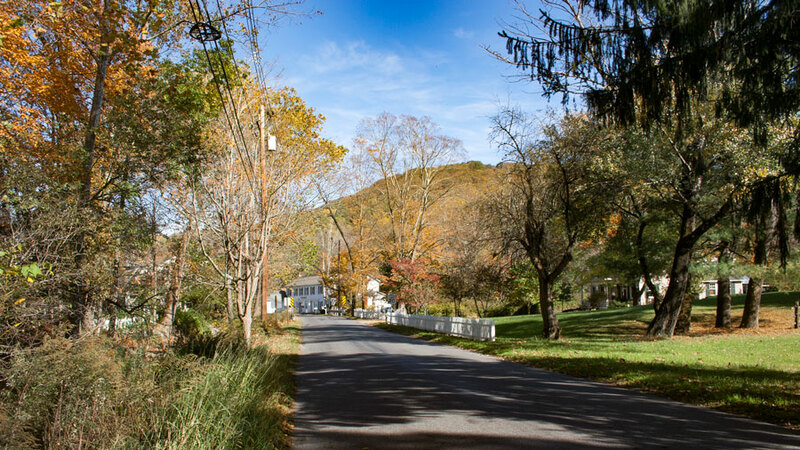 If a new house is built, it's on a large piece of property and hidden on a wooded lot, A drive today through little Mountainville takes one immediately back a couple of hundred years; the homes, school, and commercial buildings belong to another time. This village, too, has earned a position on the National Register of Historic Places. The village of Cokesbury is located on the western border of Tewksbury Township; part of the village overlaps into Clinton Township. Take Water Street out of Mountainville and you'll be there in ten minutes. The first settler in this area that we know of was Mindurt Farley, a German immigrant who became owner of 200 acres here in 1779, long before the village of Cokesbury came into existence. Mindurt Farley, after he acquired this property, served Tewksbury Township as Township Committeeman and then Freeholder. He died in 1790 and his farm was passed on to his son, Joshua. Joshua's brother John also owned farm property in the same area. Other early settlers were Jacob Apgar who married Mindurt Farley's daughter; and Jacob's brother, Conrad. When Conrad Apgar came to this area before the village existed, he lived in, and operated, a tavern until April of 1812, when it was destroyed by fire. He and his wife, Charity, then sold the property to their friend, John Farley, who built a new building there as a hotel. At about the same time the Methodist Church applied for and obtained the right to construct here the first Methodist church in Hunterdon County. 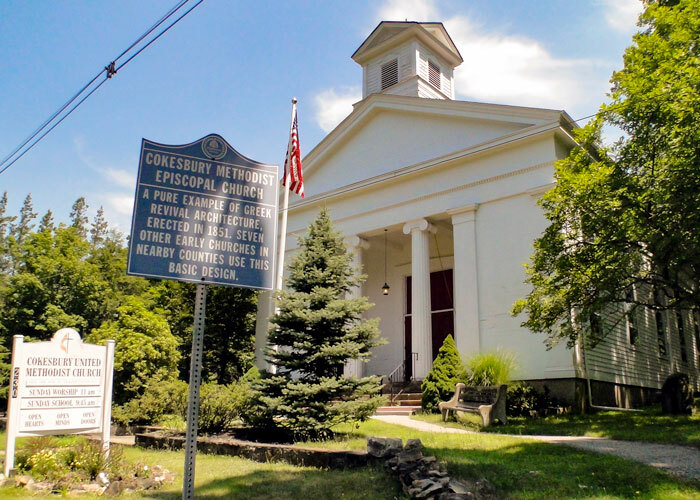 On March of 1814 the construction of the Cokesbury Methodist Church, named in honor of two outstanding Methodist Bishops in the United States, Thomas Coke and Francis Asbury, got underway. In August of 1815 the Cokesbury Church was ready for services and shortly thereafter the settlement was also named Cokesbury. The post office department complicated things by misspelling the name of "Cokesbury" as "Cokesburg" but this was corrected with typical governmental promptness. One of the early records of this village notes that it was typical of the German-American families that the women work in the fields along side the men, and accomplish as much. It was also noted that among German-American farmers, male and female, the most important and handsome structure was not the home, but the barn. By the middle of the 19th century, the population of the village almost doubled and the Methodist Church could not handle the crowd. A fine new church was built in 1851 and is still in use today. In 1855 a portion of the old tavern building was purchased by John Johnson and used as a wheelwright shop, and, with some help from the local blacksmith, began building carriages and sleighs. And for many years there existed in this area an iron mine and furnace, first operated by the British before the Revolutionary War. After the war the mine became inactive until 1870, when it was reopened by yet another member of the Farley family. This was the only successful iron mine in the township. From 1851 to 1873, twelve new homes were erected in town, and the Methodist Church in 1875 had to open a new cemetery, this one on Water Street. This burial location is still open for business, but is almost filled with Farleys, Hoffmans, Suttons, Apgars, and Lindaberrys. But by the 1880s, it was obvious this display of expansion was over. A publication that came out in 1881 stated that the community now consisted of "a hotel, store, blacksmith shop, wheelwright shop, two churches and fourteen dwellings." Thus, several business had ceased to exist, and as the new century approached, matters got worse. The old hotel closed at last, the wheelwright shop shut down, and in 1915 the post office moved away. Shrinkage was in progress and it continued through the Great Depression and World War II. At the present time Cokesbury stands proudly at the intersection of Water Street, Cokesbury Road and High Bridge Road. The fine Methodist Church still stands near the center of the village with its cemetery nearby on Water Street. A group of 150-year-old, immaculate, frame homes cluster around the little intersection. The roads are paved now; otherwise the village dates back a hundred years or more. Visit these villages, their churches and cemeteries, walk the beautiful streets, and admire those well-preserved homes of yesteryear. Many of the owners will welcome you for a visit. For more information please contact the Tewksbury Historical Society. 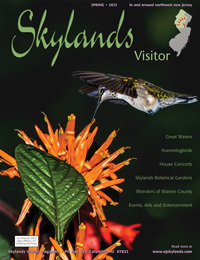 This is an inspired group which has lots of information about all of these beautiful villages.